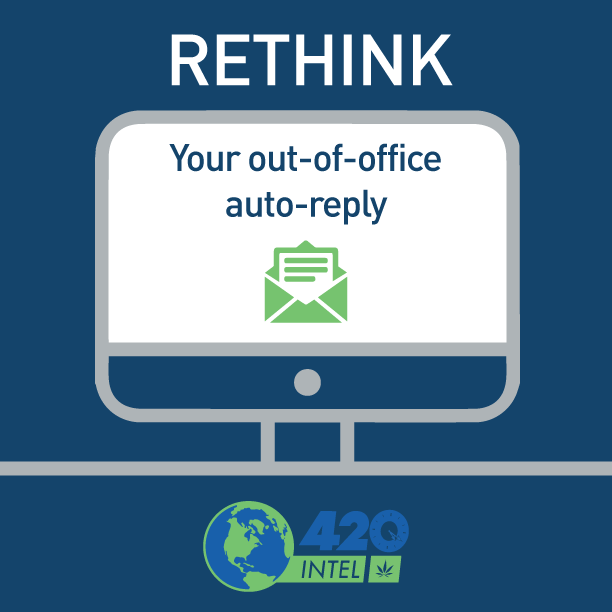 While an out-of-office reply seems to be the responsible course of action to take when away from the office, it can actually be a huge security risk and can leave you and your business vulnerable to social engineering attacks. 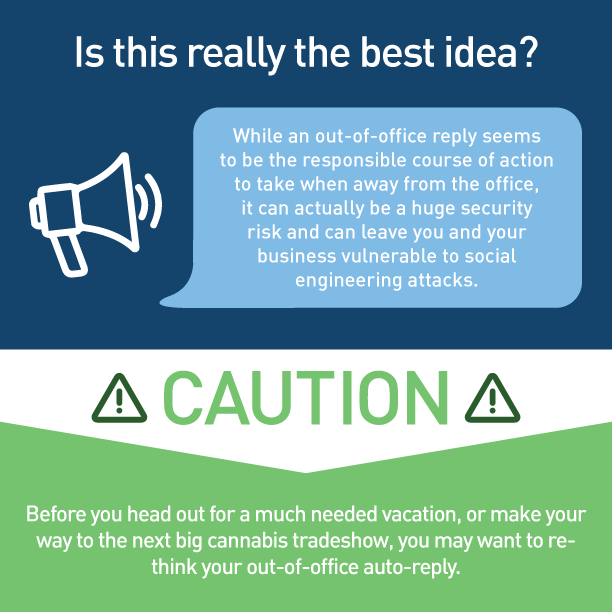 So before you head out of the state for a much needed summer vacation, or make your way to the next big cannabis tradeshow, you may want to rethink your out-of-office auto-reply. 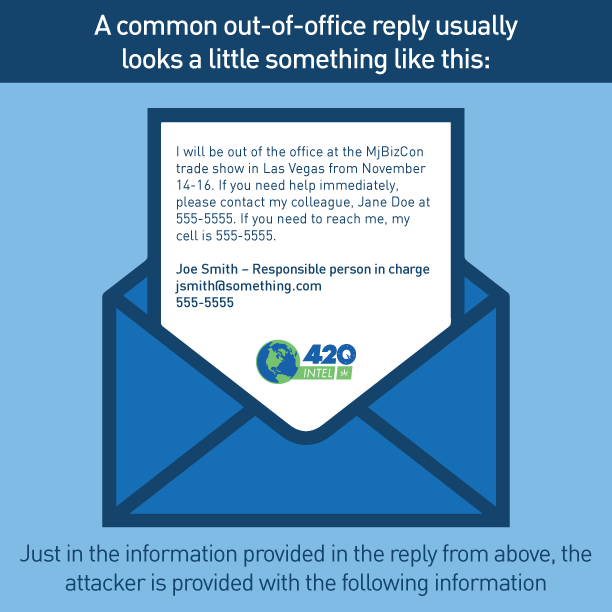 I will be out of the office at the MjBizCon trade show in Las Vegas from November 14-16. If you need help immediately, please contact my colleague, Jane Doe at 555-5555. If you need to reach me, my cell is 555-5555. Joe Smith – Responsible person in charge. 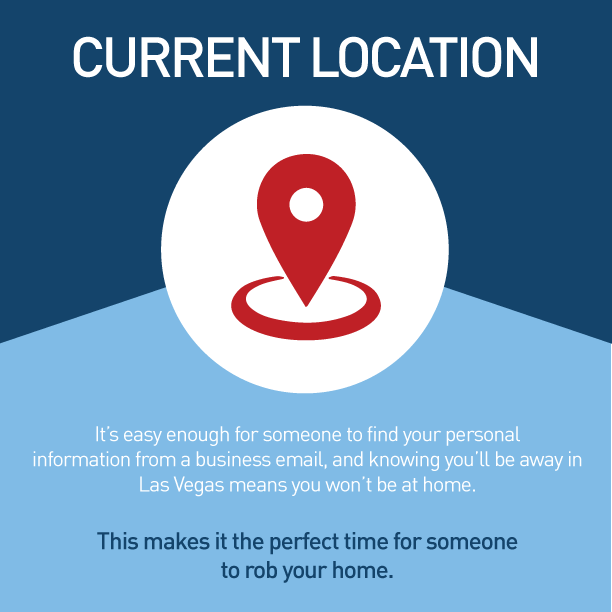 It’s easy enough for someone to find your personal information from a business email, and knowing you’ll be away in Las Vegas means you won’t be at home. This makes it the perfect time for someone to rob your home. 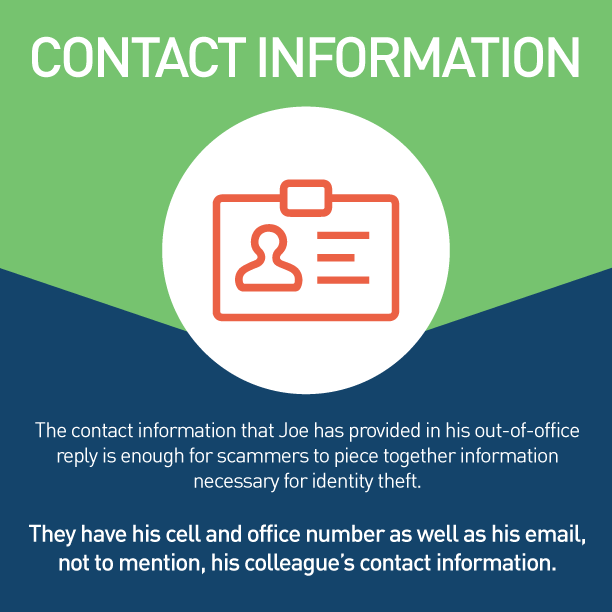 The contact information that Joe has provided in his out-of-office reply is enough for scammers to piece together information necessary for identity theft. They have his cell and office number as well as his email, not to mention, his colleague’s contact information. In the above scenario, Joe has given information about a colleague as well as his own work title. 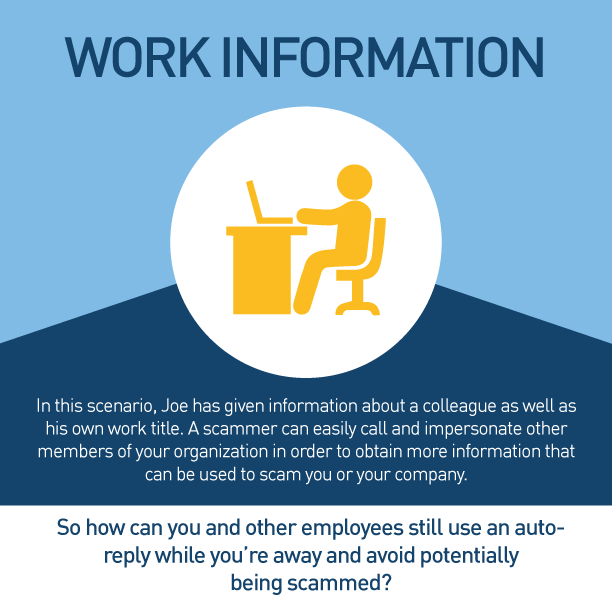 A scammer can easily call and impersonate other members of your organization in order to obtain more information that can be used to scam you or your company. 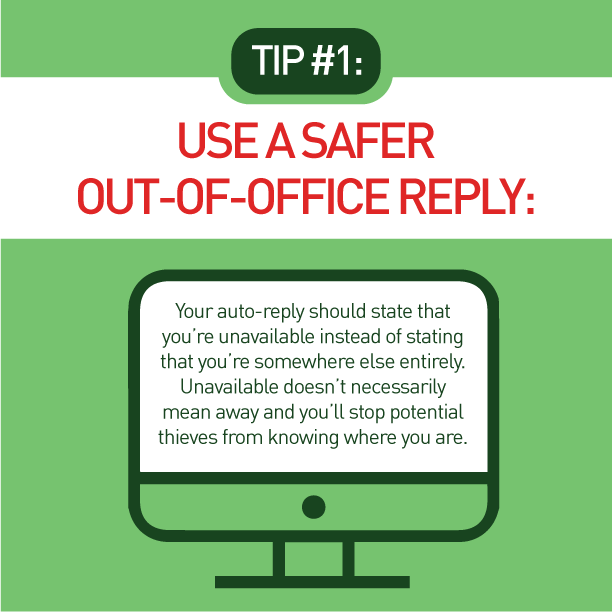 So how can you and other employees still use an auto-reply while you’re away and avoid potentially being scammed? Your auto-reply should state that you’re unavailable instead of stating that you’re somewhere else entirely. Unavailable doesn’t necessarily mean away and you’ll stop potential thieves from knowing where you are. 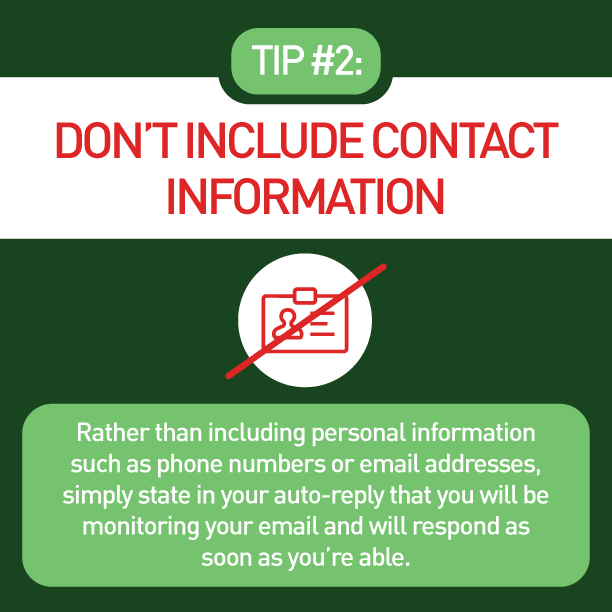 Rather than including personal information such as phone numbers or email addresses, simply state in your auto-reply that you will be monitoring your email and will respond as soon as you’re able.